It has been a big year for Selma, Alabama, with the country renewing focus on the city, thanks to an Oscar-nominated film carrying its name, and the celebrations of the 50th anniversary of the famed civil rights march from Selma to Montgomery, Alabama. One of the most highly anticipated events of the weekend was BET’s three-hour Sunday concert, which featured luminaries like Bill Withers, Cicely Tyson and Harry Belafonte (one of the original marchers). During the concert, attendees were able to see performances from: Kirk Franklin, Lady Tramaine Hawkins, Ruben Studdard, Kelly Price, The Blind Boys of Alabama, We are Toonz, Estelle, Bell Biv DeVoe, Aloe Blacc, Vanilla Ice, Doug E. Fresh, Arrested Development, BeBe Winans, Angie Stone, Eric Benet, D-Nice, DeWayne Woods, Donnie McClurkin, Eddie Levert, Flavor Flav, India.Aire, Keith Sweat, MC Lyte, Rick Ross, Tank, Tamar Braxton, Tyrese, Virtue and many more. “We want to give honor to those that showed courage 50 years ago and brought us here today,” said Ricky Bell of Bell Biv DeVoe. “It doesn’t stop here though.” Non-performance appearances were made by: Peter Yarrow (another original marcher), Bill Bellamy, Gary Owen, John Salley, Malcolm Jamal Warner, Tom Joyner and more. Musicians, actors and more entertained the massive crowd that surrounded the stage along U.S. Highway 80 with live music, dance competitions, and comedy acts. 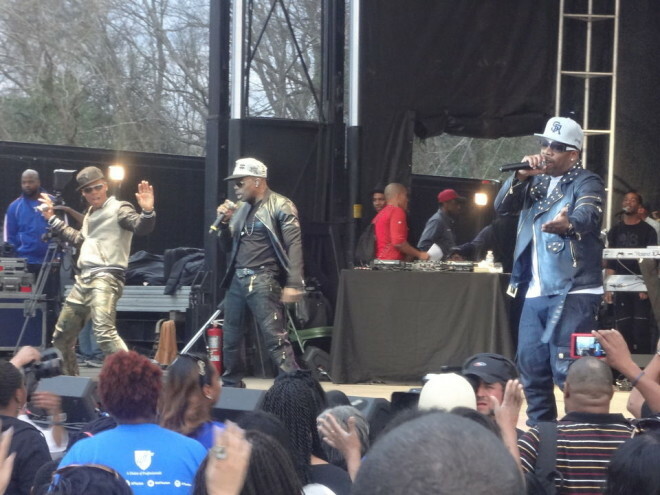 The concert, which was hosted by BET and Centric TV, was free for all and family-friendly. “This is a concert of celebration,” said Doug E. Fresh, “It’s a celebration of all people because so many different kinds of people crossed that bridge.” While the concert served as a tribute to the 50th anniversary of the Selma to Montgomery march, several speakers used the public event as an opportunity to raise awareness about today’s issues when it comes to racial injustice. 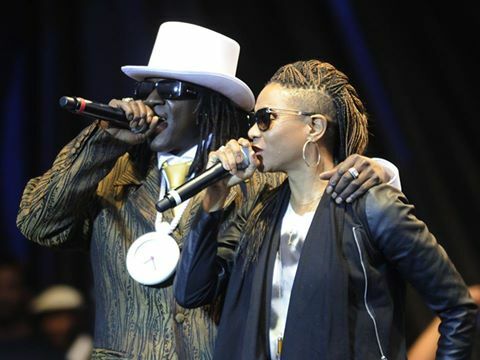 The biggest moment of the show was the ensemble performance of “Self-Destruction,” which was sung by: Rick Ross, Bell Biv DeVoe, Flava Flav, Doug E. Fresh, MC Lyte, D-Nice, Vanilla Ice and others. The Stop the Violence Movement was begun by rapper KRS-One, in response to violence in the hip-hop and African-American communities. Composed of some of the biggest stars in contemporary East Coast hip-hop, the movement released the single, “Self-Destruction,” in 1989, with all proceeds going to the National Urban League. BET only began booking the event on February 19th when Selma representatives asked for help putting together the March 8th event. The network tapped executive Paxton Baker and Belafonte to serve as co-artistic directors, whose duties included selecting talent among other tasks. The two of them had just over two weeks to put together the three-hour extravaganza. The concert will air on Sunday, March 15 with historical footage, interviews and photographs. Don’t miss it!